Okay, so first of all, you all already own The Knitter’s Book of Yarn, right? Right? If you don’t, I’m going to assume the reason is because you a) know someone who owns it and borrow it when needed, b) have permanently absconded with the copy from your local library, or c) are Clara Parkes and therefore know everything that is in the book and therefore don’t need your own copy of it to remind you. And if you’ve read the Knitter’s Book of Yarn, chances are you already know how wonderful it is, and therefore can guess at the awesomeness of its sequel, The Knitter’s Book of Wool. 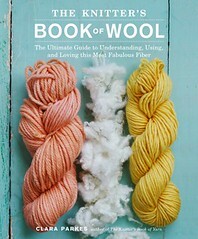 I’m a big fan of wool, so I’m very happy about this book. If you have ever taken a skein of wool of any kind from your stash and given it a loving squeeze or imagined in your head what you would like to knit it into, just based on touch alone, then this book is for you. Like its predecessor, the Knitter’s Book of Wool is divided between knitting knowledge and knitting patterns. Independently, these two contributions would make a worthy publication, but here they are combined in the same volume, to make it more than simply a collection of patterns but a book that will sit in your knitting library to be consulted time and time again. In the first four chapters, Clara Parkes takes you through ‘What is Wool’, ‘Turning Wool into Yarn’, ‘Meet the Breeds’ and ‘Plays Well With Others’. These four chapters are a pretty thorough education into what makes wool such a versatile and useable fibre. Spinners in particular will likely enjoy Chapter 3 on sheep breeds. Ever wondered what the difference is between Cormo and Merino, or Bluefaced Leicester and Border Leicester? Well, Clara will tell you. She’ll also tell you about what will happen when you blend wool with different types of fibres and what you can achieve with that yarn and why. The patterns that accompany this fibery education are a pretty versatile collection. There are items in here that will appeal to beginners on up to seasoned knitting veterans, for women, men, children, and home. 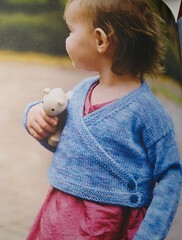 How about this Bella baby sweater, for example? Surely something that could be knitted quickly and stylishly for wee recipients. The adult sweaters are also accessible to a variety of skill levels, and are constructed in a way which shows off the texture of the wool being used. 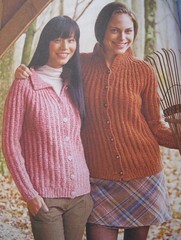 I like the Allegan Cardigan (by Sandi Rosner) and Comfy Cardigan (by Pam Allen), below. The patterns I really keep coming back to look at, though, are the shawls. There are several here, of all different construction types and using a variety of yarn weights. Just get a look at the Falling Water stole by Jane Cochran, for example. Couldn’t you see this draped at your desk chair for chilly working days, ready to accompany you right out into the brisk air over your coat? I sure could. Then there’s Sivia Harding’s beaded Tibetan Clouds stole, which is so beautiful that I do not see how a person could knit this without imagining herself wearing it to an elegant dinner soiree and meeting the tall dark and handsome stranger of her dreams rocking the lace like there’s no tomorrow. These last 2 stoles are the patterns I am hoping to cast on for some time soon…if the Christmas knitting doesn’t get me first, heh. I think the best compliment a knitting book could get is that it makes me want to knit things from it right away. Clara Parkes, this is a winner. Not giving this one away huh? Too bad – I am apparently one of those closet dwellers who doesn’t have the first book and based on your review I would very much like to have the second! It makes me look forward to that time off over Christmas when if you haven’t finished your Christmas knitting it’s too late anyway and you might as well knit something for yourself… !! 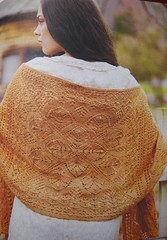 I love The Knitters Book of Yarn so much that I bought the Wool one online sight unseen. I was not disappointed! I don’t think I was quite as taken with the patterns in this second one as I was in the first, but there are still many lovely things to knit. And of course it’s chock full of good writing and good info…I just hope Clara Parkes doesn’t run out of things to say; what’s next, I wonder? I love the Knitter’s Book of Yarn, but I had now idea there was another one!! I’m off to Ravelry right now to check out all the patterns….. The Tibetan Clouds made my eyes misty. So beautiful . . .
Tibetan Clouds in Tanis laceweight (doubles) – that’s my plan. Nice when you buy a book for a single pattern that the book turns out to be excellent. I was already jonesing this book — and now I have to own it. The question is: Can I wait and put it on my wish list for the holidays — or do I need it right now?! Oooh, thank you for this book review. I would never have thought to pick this up, but now I just might. you convinced me. I ordered the book today.